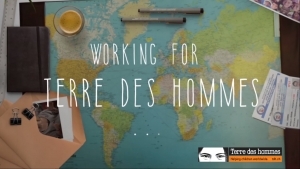 Terre des hommes Foundation is looking for a Web Editor to establish a regional website for its activity in Europe and country websites for Moldova and Romania based on its main website www.tdh.ch. You are passionate about web content management. You are organized, well-structured and can work with content in English, Romanian, and Russian languages. You are comfortable and experimented with the CMS Drupal? This challenge is for you. The candidates must be legally eligible to work in Romania or Moldova. Terre des hommes (Tdh) is the leading Swiss organisation for children’s aid. Founded in 1960, we are committed to improving the lives of millions of the world's most vulnerable children. Through our innovative health, protection and emergency relief programmes, we provide assistance to over three million children and their families in more than 45 countries each year. In Europe, Terre des hommes has operational programmes in Albania, Kosovo, Moldova, Romania, Ukraine, Greece, and Hungary. We also work together with partners to create regional projects, synergies and develop transnational solutions to problems such as child trafficking or the protection of children on the move. Tdh’s activity in Europe is coordinated by the regional office in Budapest, opened in 2005. We are looking for an agency or individual who will create/ establish a regional website for its activity in Europe and a country website for Moldova based on an existing Drupal template similar to https://tdh.uk/. The current regional website is http://tdh-europe.org, the website of Tdh Moldova is http://tdh-moldova.md/ and of Tdh Romania - http://www.tdh.ro/. The new websites will be hosted in a new multi-sites server and will follow the design and structure elements of the parent website. Training local staff in content management in Drupal. The Web Editor will closely work with the Digital, Content Promotion, Photo & Video Manager and the Regional Communication Officer. Terre des hommes will provide all relevant content, including texts, photos, videos, and publications. Qualified applicants are encouraged to submit their CV in English, portfolio/ proof of experience, and price offer to office@tdh-moldova.md. Please include “Web Editor” in the subject line of the application email.